Tomorrow, April 4, 2018, marks the 50th anniversary of Martin Luther King, Jr.’s assassination outside of the Lorraine Motel in Memphis, Tennessee. King, a prominent leader of the Civil Rights Movement, fought for equality and preached tolerance and acceptance for all people. While his famed “I Have a Dream” speech became, and still is, a rallying cry for many, King continued to remind his followers of the work still to be done. In the decades following his death, King’s family and followers remain committed to upholding his legacy and continuing his work. Along with them, a number of highly-rated organizations continue to represent the values King worked so tirelessly to promote. A few of those organizations are listed below. Consider supporting one of these outstanding organizations in King’s honor today. The Constitution declares and protects our freedom of speech. 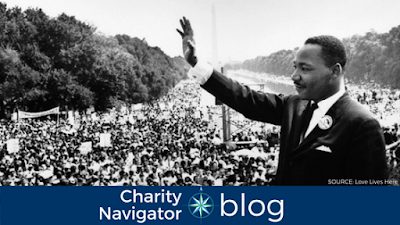 This freedom was essential to King’s success as a leader and, ultimately, the success of the Civil Rights Movement. The Institute for Free Speech works to defend our First Amend rights to free political speech, assembly, and petition. They provide education and trainings, as well as legal representation for those facing First Amendment cases. The Civil Rights Movement worked to establish the rights of African Americans and other marginalized groups through fair and just legislation. Established in 1910, the National Urban League seeks to empower African Americans to enter the social and economic mainstream. It continues to protect and defend the values and principles of the Civil Rights Movement today. The NAACP Legal Defense and Education Fund was founded in 1940 to provide legal representation to poor and underserved African Americans. While the Fund continues to work primarily in the court system representing the interests of African Americans and other groups, it also works on policy and legislation, education, and advocacy issues. King believed in and fought for fair and equal representation for all people. Public Advocates provides legal support to those affected by poverty and racial discrimination. It works alongside grassroots groups to affect local change. At the root of the Civil Rights Movement was a call to create and adopt fair legislation that would represent all people and eliminate discrimination. The Advanced Project continues to promote progressive civil rights. The organization works locally to help communities identify and dismantle discriminatory legislation to promote racial justice and just democracy for all. The National Civil Rights Museum is located at the Lorraine Motel in Memphis, Tennessee, where King was assassinated. The serves as chronicles the Civil Rights Movement and aims to highlight ongoing civil and human rights issues in the United States and around the world. National People’s Action is a network of grassroots organizations and organizers that working to advance economic and racial justice. Their key issues include bank accountability, housing justice, and immigrant and workers’ rights. The American Civil Liberties Union works to protect the rights and liberties of all Americans. Some of these rights are the ones King ultimately died trying to achieve. While this organization is the national litigation and communications body of the ACLU, local chapters work with communities to provide legal support and education. The Southern Center for Human Rights works for justice and equality within the criminal justice system. They are committed to ending capital punishment, mass incarceration, and other practices and that unequally affect poor people, people of color, and other marginalized groups. King believed in equality for all, and tolerance and acceptance of others. Lambda Legal works to protect the rights of the LGBTQ community and those diagnosed with HIV. They provide legal support and work to create and promote fair policies and legislation for their constituents. Each year, in mid-January, the United States observes Martin Luther King, Jr. Day. This day, which has often been called a “Day On, Not a Day Off” is a time to celebrate King’s legacy by participating in local service projects. 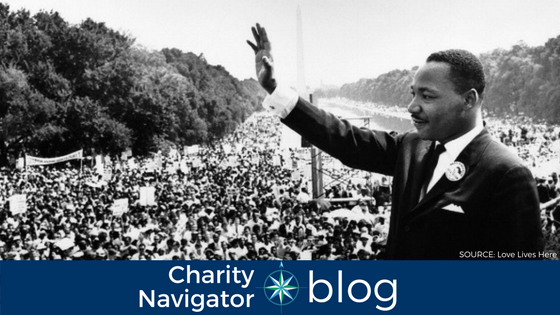 If you’d like to honor King’s memory in this way, consider using Charity Navigator’s Advanced Search Tool to find an organization in your area that could use your help.